Description of decorations: Background 3D homemade 1-2 mm sand, rocks of the river, roots and branches, dried leaves. Description of equipment: Lighting: economic bulb 24w. Filtration: Aquael internal filter. Water parameters: Temp: 24°C; pH 6,3; GH 2; TDS 30. Guaporé River (Portuguese: Rio Guaporé) is a river in western Brazil and northeastern Bolivia. 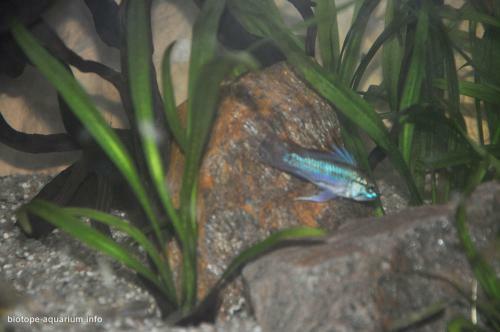 Its Bolivian name is Río Iténez. It is 1,530 km (950 mi) long; 970 km (600 mi) of the river forms the border between Brazil and Bolivia. The Guaporé River is part of the Madeira River basin, which eventually empties into the Amazon River. The Guaporé River crosses the eastern part of the Beni savanna region.It forms the border of the 615,771 hectares (1,521,600 acres) Guaporé Biological Reserve, and is fed by rivers originating in the reserve, the São Miguel, Branco, São Simão, Massaco and Colorado. Unlike other rivers in the Madeira system it’s a “clearwater” right bank tributary to the Rio Mamore and drains the eastern Bolivian lowlands and southern Brazilian Shield. It originates in the Mato Grosso Plateau, Brazil and therefore variety of flora and fauna is similar to those found in the Pantanal wetlands region. Extensive areas of seasonally flooded forests and savannas, swamps, marshes, and shallow, flat-bottomed lakes creates a unique ecosystem with variety of specialized habitats. Whole area is extremely rich in flora and fauna species. Literature says there is about 600+ different fish species in Itenez drainage. Some people call Rio Guapore the most rich river in aquatic plants all over the South America. 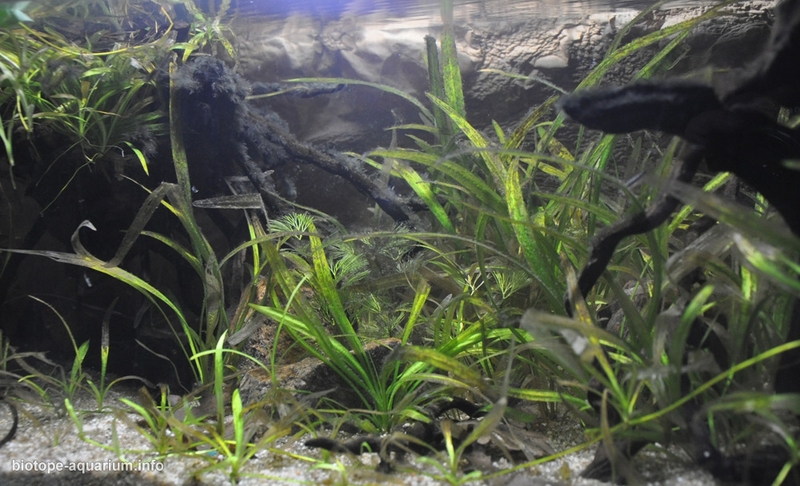 Description of the underwater landscape of the biotope: Specified biotope reprezented in my aquarium shows an oxbow edge of shallow stream. It’s the story of a pair of Apistogramma trifasciata and their offspring for several generations. I have been trying to create a type of coastal area full of submerged aquatic plants (Echinodorus quatricostatus and some Cabomba furcata) during the rainy season, and partially or fully emersed when the rains don’t fall. Some of these plants die in the dry season leaving the macroalgae. 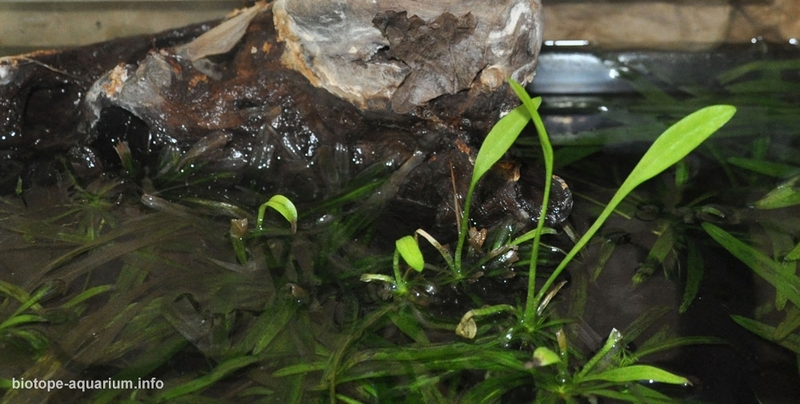 The slow motion of the water in the oxbow area, where the flow was stronger in the past,and the encroached tree roots occur, creates a perfect microhabitat for the Apistogramma trifasciata group. The thick layer of dead leaves, branches and bark gives hidden spots and varieties of food sources for this species. 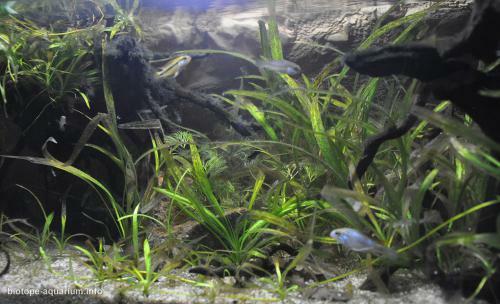 This area is also covered echinodorusi creend numerous territories for Apistogramma. When they did not feed, the apisto males patrolled their districts below, trying to attract females and trying to become the “alpha male”; and the women disputed their places of deposition. I have seen hierarchy in both males and females. A real show. In the aquarium I tried to recreate both the rainy season and the beginning of the dry season. That’s what I tried to look at in pictures. Description of the parameters of the habitat: Water parameters varies depends of specific habitat, but water is almost crystal clear (small amount of tannins occur in the forest areas), soft and slightly acidic with parameters: pH 6,0-6,8; hardness 1 ºdH; electrical conductivity 5-20 µS/cm (to 100µS/cm in the seasonally almost drying lakes and oxbows), temperature 22-28ºC. List of fishes and invertebrates occurring in the nature biotope: Aphyocharax sp., Hemigrammus sp., Gymnocorymbus sp., Hyphessobrycon sp., Corydoras sp., Otocinclus sp., Apistogramma sp. and many more. List of plants found in the nature biotope: Eichhornia azurea, Echinodorus sp. (many species), Ludwigia sp., Cabomba furcata, Myriophyllum sp., Hydrocotyle leucocephala, Egeria najas, Salvinia auriculata and many more depends of water mark during high and low water levels. Threats to the ecology: Apistogramma trifasciata not a species rated in the Red List but excessive pollution and deforestation in recent years may endanger the species. However, it has been found that a source of pollution of the Itenez basin is mercury vapors. Sources of pollution are mainly motor boats and gold exploatesions that are still practiced. Although mercury pollution is lower than in other regions, there are studies showing that in the poisoned organism the bioaccumulation mechanism expresses an increment of mercury concentration over the lifetime of each individual. To eliminate the pollution, or at least to diminish it, it is necessary to measure tourism and trade as environmentally friendly as motor boats to eliminate as much as possible noxes.